This week the pair NZD/USD lost around 150 points and reached the level of 0.7285. The instrument has left the wide upward trend, which made the investors rapidly increase the short positions volumes. 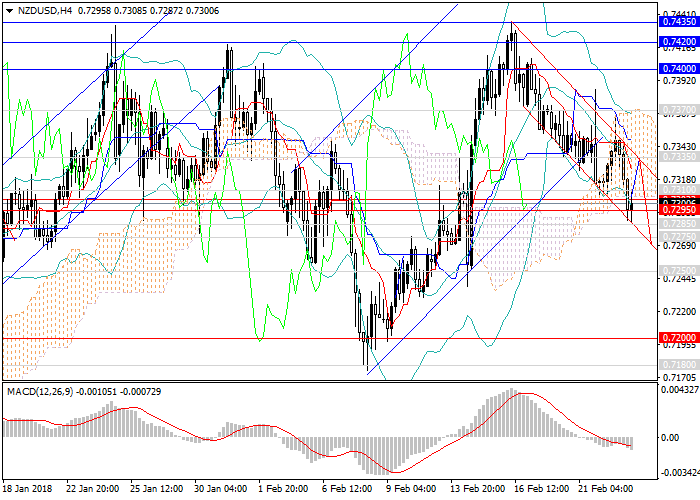 The pair is now trading within the narrow downward channel and reached the lower border of the range. US dollar is growing due to the positive employment market data and key indices releases this week. It is additionally supported by the change of the trading moods in its favor. Today in the macroeconomic calendar there is lack of issues, which affect the dynamics of the pair. As there is no key catalyst, the pair is expected to enter a narrow sideways consolidation and later decrease to the levels of 0.7250, 0.7200, 0.7180. In case of a breakdown of the February minimum at the level of 0.7180, the instrument can decrease to the next strong support levels of 0.7130, 0.7050. On the 4-hour chart, the technical indicators confirm the fall, MACD long positions volumes are going down rapidly, Bollinger Bands has reversed and are pointed downwards. Resistance levels: 0.7310, 0.7335, 0.7370, 0.7400, 0.7420, 0.7435. Support levels: 0.7295, 0.7275, 0.7250, 0.7200, 0.7180, 0.7130, 0.7050. It is relevant to increase the volume of short positions at the current level with the targets at 0.7200, 0.7050 and stop loss at 0.7380.